Who would prevail if Ivan Rodriguez faced son Dereck? October 31, 2011 C Ivan Rodriguez assigned to Criollos de Caguas. October 30, 2011 C Ivan Rodriguez elected free agency. September 3, 2011 Washington Nationals activated C Ivan Rodriguez from the 15-day disabled list. August 30, 2011 sent C Ivan Rodriguez on a rehab assignment to Harrisburg Senators. August 28, 2011 sent C Ivan Rodriguez on a rehab assignment to Potomac Nationals. July 7, 2011 Washington Nationals placed C Ivan Rodriguez on the 15-day disabled list. Strained right oblique. June 8, 2010 Washington Nationals activated C Ivan Rodriguez from the 15-day disabled list. June 7, 2010 sent C Ivan Rodriguez on a rehab assignment to Potomac Nationals. May 24, 2010 Washington Nationals placed C Ivan Rodriguez on the 15-day disabled list retroactive to May 23, 2010. December 11, 2009 Washington Nationals signed free agent C Ivan Rodriguez. 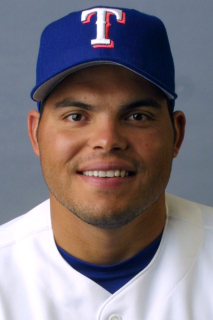 November 11, 2009 C Ivan Rodriguez assigned to Criollos de Caguas. November 5, 2009 C Ivan Rodriguez elected free agency. August 18, 2009 Houston Astros Traded C Ivan Rodriguez to Texas Rangers and Hickory Crawdads Traded RHP Matt Nevarez to Astros Organization.